Probably most works of art are better seen than described, but it’s the rare one that’s best not described at all. I think Steve of Tomorrow might be one such work, though maybe it’s just that I’m not quite sure what to say that doesn’t dilute its incredible strangeness and epic verve. So, the basic facts: Written and directed by performance artist David Commander, Steve of Tomorrow is a multimedia puppet show presented by Immediate Medium, an “anti-disciplinary artist collective,” and the Collapsable Hole, a massive, shadowy space in the basement of a West Village apartment complex. 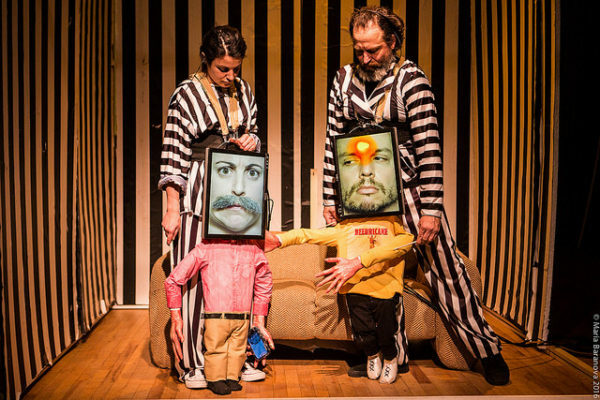 Two of its principal performers, Commander and Lisa Clair, lug child-sized puppets around a spare apartment setting. Where their heads ought to be, the puppets wield massive tablets which stream images of their characters’ faces, lips moving and eyes shifting as the action demands. Intermittently Commander and Clair ditch the puppets and retreat to the other half of the stage, manipulating action figures before tiny green screens. Scenic transitions are marked by the sliding of a giant screen in front of whichever set is in disuse; many scenes, Commander and Clair record many segments, including the action figure sequences, on handheld video cameras, projecting the action onto the screen. A third performer, Rob Ramirez, operates the show’s technical elements and voices a few of its peripheral characters from offstage. There’s… a lot going on in Steve of Tomorrow, in form as well as content. The story follows a couple, Scott and Ralph, their puppets operated by Commander and Clair, respectively, though it’s unclear who voices each character. Scott is distressed over his malfunctioning microwave and car, and at Ralph’s apathy towards these troubles. Ralph, who blogs about science fiction, is debating Star Trek and time travel with a troll. In a desperate attempt to prove that time travel is real, he blogs an invitation to all time travelers to come crash at his place. Eventually one shows up, which is where we meet Steve (of tomorrow). Meanwhile in the green screen half of the stage, a series of newscasts document a local corporation’s latest achievement: the manufacture of a hurricane. It’s weird, frenetic, funny, hard to follow. Everyone seems pretty thrilled about the hurricane, Hurricane Deluxe, and why wouldn’t they be—life in Steve of Tomorrow seems pretty mundane without it, a dull trudge through squabbles domestic and digital. It’s about time things get shaken up. For his part, Steve doesn’t shake much, mostly preferring to lounge on the couch. Are all people in the future so relaxed, or is this simply his first chance to chill in a very long time? The play generally declines to give too much information, luxuriating instead in the strangeness of it all, the frisson caused by its various formal elements clashing together. Commander, Clair and Ramirez voice a cast of action figures—anchors, weatherman, the company’s CEO—as the hurricane gradually gains power and consumes their region. These sequences have the delicious analogue feel of, say, anything on Adult Swim, but especially Tim & Eric—low-res video, intensely exaggerated characterizations, a general embrace of things not going as planned. The strange gaps in Steve of Tomorrow, the long silences and the fuzzy animations, are as crucial to its fabric as anything that goes smoothly. This is a show with many deeper concerns, but chief among these is the distance between what we hope from the future and what we get. In Steve of Tomorrow, what we get is the power to destroy ourselves with a smile on our faces and our favorite news personalities on the TV. What Steve brings from his own, more distant future is still more chaos, driving a wedge between Scott and Ralph. Not that he came to sow harmony anyway—the hurricane destroyed all sorts of knowledge which he was sent back to retrieve. As apocalyptic visions go, Commander’s doesn’t seem all that far-fetched. Our industries have already manufactured hurricanes, more or less, by raising world temperatures; this hasn’t yet become a cause for celebration, though plenty of other dystopian causes have. What Steve of Tomorrow ultimately suggests is that our self-destructive tendencies, be they in our intimate relationships or our broader cultures, will catch up to us sooner than we expect.